Pitchers and catchers recently reported to Spring Training, and Florida’s Southeast coast is the epicenter of Grapefruit League action, thus the shoulder season shines on the PGA Golf Club, PGA National Resort. There’s still time to head south for those last minute trips to catch a game or two, or better yet, a round or two of sunshine golf sojourn this spring, PGA Golf Club is offering a wide array of golf packages featuring its three onsite golf courses (Dye, Ryder and Wanamaker), nearby St. Lucie Trail Golf Club and a variety of lodging options to suit any size golf group. And Mets fans take note: the spring training home of the “Amazings” is next door at 7,000-seat Traditions Field. Look, weather, conditions and value notwithstanding, I don’t think there’s ever been a better time to visit PGA Golf Club. Its 20,000-square-foot clubhouse has been completely renovated and now includes a modern golf shop, the American-British fusion Taplow Pub featuring a cozy, welcoming interior, and the ever popular NINETEEN-SIXTEEN Bar & Grille, a members-only restaurant adjacent to the 18th Hole of the Wanamaker Course. For history buffs, the PGA of America has relocated many historic trophies and artifacts that trace its nearly 100 years run to the new “PGA Gallery” area of the clubhouse. A showcase of the major championship trophies of golf includes the PGA Championship’s original Wanamaker Trophy. The Senior PGA Championship’s Alfred S. Bourne Trophy and the Vardon Trophy, with its iconic overlapped hands sculpture, are also prominently displayed. Additionally, PGA Golf Club’s Wanamaker Course underwent a significant re-grassing project late last year, a project that has vastly improved the playing experience by introducing new turf to fairways and bunker surrounds, and planting several ornamental species to reframe holes. The Wanamaker was recently rated one of the top-five courses in Florida by The Golf Channel’s course rating website, Golf Advisor. An now we come to my own personal favorite destination in South Florida, The PGA National Resort and Spa. For many of us who have been bottled up all winter, the only thing better than one golf destination is two. So, a few days at the PGA Golf Club followed by a few more at the PGA National Resort and Spa makes a whole lot of sense to me. 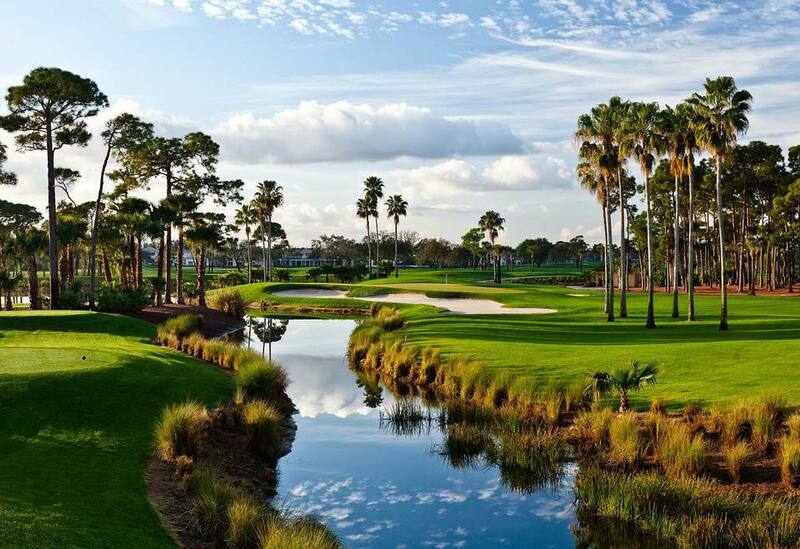 The legendary PGA National offers 90 holes of world-class golf on five courses including the famed Champion Course, home to the popular PGA TOUR Honda Classic and past host of the Ryder Cup, PGA Championship and several Senior PGA Championships. Through April 30, PGA National Resort & Spa’s popular Gold Golf stay-and-play starts at $329 (per person, per night, double occupancy) and features a daily round on one of the resort’s layouts (surcharge for the Champion Course). Included are nightly deluxe accommodations, complimentary cart fees and club storage, access to PGA TOUR quality practice facilities with unlimited range balls, and full daily breakfast at the Palm Terrace. Cardinals fans, time for you to take note: the Redbirds’ Roger Dean Stadium is only minutes away from PGA National. PGA Golf Club is conveniently located off Interstate 95 in Port St. Lucie, Fla. just 50 minutes north of Palm Beach International Airport (PBI). PGA National Resort and Spa is only 15 minutes north of PBI. Known as the “easy in, easy out” airport, PBI offers nearly 100 non-stop flights to more than 25 cities in the U.S. and Canada. Both golf havens are about a two-hour drive from Orlando, Miami and other Florida population centers.